1. Machzor Kol Koreh v1.3: New upgrade including many changes and improvements. Embedded sound files of nusach and niggun. Expanded p'sukey d'zimra section, more meditations prior to Ne'ilah, full Yom Kippur Torah reading, minchah Torah reading and interpretive haftarah for Yom Kippur, havdalah, Kos Miriam. Machzor Kol Koreh is a subscription service, so all future editions are included in the initial price. 2. Harley Rothstein's *Nusach and Niggun for RH and YK*: A gentle and melodic approach accessible to you whether you are an emerging or experienced ba'al tefillah. Rabbi David Rosen says Jewish dietary laws - kashrut - should encompass the harm caused by eating meat. He’s based in Israel where veganism is taking off with both the Muslim and Jewish populations and argues that that vegan is the new kosher. 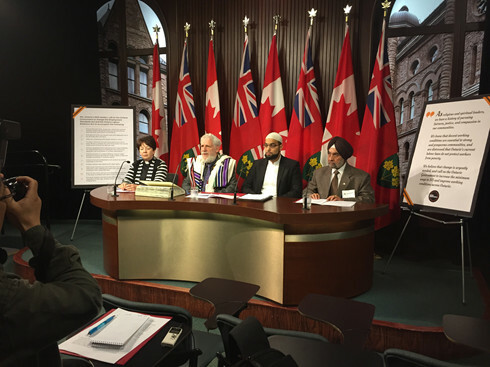 The next World Parliament of Religions (WPR) is taking place in Toronto from November 1-7, 2018. The WPR is the world's most religiously and culturally diverse interfaith event, involving over 200 spiritual traditions and over 80 countries. Attending this event is an unforgettable experience! A contingent of Jewish Renewal clergy attended the last Parliament in Salt Lake City in late 2015, and we again expect to have a sizable group attending this year. But you don't have to be a clergy person to attend! There will be opportunities for amazing and memorable davenning, as well as the possibility of a workshop on Jewish Renewal. As well, we will be organizing an evening of stories and song to introduce the Toronto Jewish community to Jewish Renewal. Thinking of Going to the ALEPH KALLAH This Summer? ALEPH Canada is collaborating with ALEPH to offer a special Group Discount to Canadian residents. Take $100 off the prevailing price of KALLAH 2018 for full-week, adult registrations, in dorms or hotel. For the lowest price, take advantage of this special offer in conjunction with Early Bird pricing now in effect until January 31! Groups must have a minimum of 8 persons and a maximum of 16 persons. If there are 16 people registered in one group, a new group will be formed with a new minumum of 8 persons. Get your friends and communities together to form groups! Discount codes are not applicable to already discounted Kesher (35 and under) rates, nor Teen and any other Youth rates, because they are already greatly subsidized. If you are interested in this offer, please contact me, Rabbi Sherril Gilbert, director@alephcanada.ca. As soon as we have a group of at least 8 intended registrants, we will send you a discount code which can be used right away to register for KALLAH. Deadline for Early Bird registration is January 31, so you should contact me before that date to get the best price. Or Shalom is an egalitarian, participatory, Jewish Renewal shul located in Vancouver, British Columbia, Canada. Or Shalom is seeking a full-time Program Coordinator to work under the supervision of Rabbi Hannah Dresner to help advance the community’s vision of engagement and growth. The Program Coordinator is responsible for implementing programs, coordinating special events, and developing community connections and outreach to raise awareness of and involvement with Or Shalom. Just added to the ALEPH Canada ReSources Catalogue in time for Chanukah! The S'fat Emet on Parashat Miketz/Chanukah. Posted by Rabbi Daniel Siegel, who writes, "There is much in this series of teachings I love: that darkness is limited, that trust in God, in the cosmos, in the love we all feel, is a true necessity and relying on the generosity of others to further our own careers is misplaced. Best to stay true to what one believes and be willing to accept the consequences. "Given the way the sefer is put together, it is special because Miketz is the sidrah for the Shabbat of Hanukkah 70% of the time. So what we get are 19 teachings over thirty three years, all given on Shabbat Hanukkah, Parashat Miketz, and based on the same unit of B'reishit Rabbah. We get to follow his thinking from year to year as he is drawn to the same theme over and over again. He's thinking something through, something that engages him again and again throughout his life. What was troubling him? What was it that drew him to talk about light and dark and the power of evil so much? Note that the verse which begins the midrash is from Job, as are at least two other citations. What does that tell us?" Find this incredible teaching in the ALEPH Canada ReSources Catalogue, available free or for a small donation. Visit the ReSources Catalogue here and click on Jewish Spiritual texts: https://www.alephcanada.ca/catalogue/#!/Jewish-Spiritual-Texts/c/25660196/offset=0&sort=normal. Chanukah samayach! My tears are salty as the sea as I look out on Your ocean. My words form into prayer, lost in the sound of the waves. I cannot fathom the depth of Your creation. In the grey-blue waters that move and bend beyond earth’s gentle curve. In every stone and grain of sand washed to shore by surf. Night falls to the rushing sound of waves cast up by the ocean. A silent sea of light that flows and brightens high over the waters. I will always stand in awe of stars and ocean. In each blade of grass, each dry leaf that falls from the tree. Every day, in every voice I hear and every face I see. Compiled by Reb Sherril Gilbert, with gratitude to R’ Chava Bahle, R’ Debra Orenstein, & R’ Avraham Greenbaum, Margaret Wheatley; Judaism Unbound podcast; and to Rabbi Hannah Dresner for the spark of the idea. So there is this passenger sitting on a train and he is watching with astonishment this older man across the aisle who keeps repeating the same behaviours, over and over again. First the old man is mumbling a few words to himself, then he smiles, and finally he raises his hand and stops talking for a few moments. Renewing Judaism happens everywhere. That's one of the things that was affirmed for David and me during the Listening Tour: the renewing of Judaism is, and always has been, bigger than any organization. And that's exactly how it should be. The renewing of Judaism is organic, and multifaceted, and it’s all over the place. Those of us who are ordained in the lineage of Reb Zalman z”lare obvious and visible stewards of that renewing. But the renewing of Judaism is so much bigger even than the growing community of clergy who self-identify as part of that lineage. Renewing Judaism means spiritual technologies that enliven Judaism. Matching aliyotof Torah with a theme that arises from the text, and offering a blessing rooted in those words and that theme. Making use of chant as a spiritual technology, maybe cherishing melodies from Rabbi Shefa Gold or from Nava Tehila. Offering a meditation minyan or integrating Jewish contemplative practice into our spiritual lives. Practicing hashpa’ah (spiritual direction). These are some of the spiritual technologies that have arisen over the last few decades -- and I can't wait to see what the next ones will be. Fully 36 times, Torah calls Jews to help “the widow, the orphan, the poor, and the stranger.” Refugees of war-torn Syria, fleeing the violence of religious and tribal warfare, are all of these. As Jews, we must help: Jews bear history’s imprint of the homeless refugee, collective victims of political barbarism. For Jews not to help is to betray our history and miss a chance to redeem our history: we are to love these people, for we were strangers in the land of Egypt (Deut. 10:19). It is doubly incumbent on Jews – who ourselves descend from refugees fleeing war and extermination – to aid our Syrian cousins at this time. Maimonides taught that the highest form of tzedakah (charity) is to help another find a job so that one breaks free of needing charity (Mishneh Torah, Matanot Aniyim 10:7). Maybe even higher than charity that unshackles another economically is charity that unshackles another spiritually – charity that not only meets gripping economic need, but also loosens the grip of hatred and bigotry. It’s certain that Reb Zalman, may his memory be a blessing, has provided the spark that started many conversations. We’ve been having a year-long one here at ALEPH Canada. You can probably glean from today’s post from Reb Daniel that the last year has been an active and exciting one for us, with many changes. One of the most fruitful and engaging activities in which we were involved was a pan-Canadian, participatory strategic planning and visioning process that took us from Montreal to Regina to Vancouver. So far (because the conversation is not over – we want to hear from you too! ), we have learned that what participants want ALEPH Canada to be is the place to go to for finding resources and making linkages. Canada Day has a special and personal significance for me. It was on the first of July, ten years ago, that I came back home after seventeen years in the States. Seven of those years were spent first, as the Rabbinic Director of ALEPH [Central as we call it] and then as its Director of Spiritual Resources. The ALEPH I left was in serious financial difficulty and had to divert its precious resources to its Executive Director, leaving insufficient funds to support the development of the spiritual resources which really are a crucial part of its purpose. My first priority on returning to Canada was to incorporate ALEPH here, so that we could play an important role in these changes. You rose to the challenge by channeling your now tax deductible contributions through ALEPH Canada so that I could continue the work of developing resources. This has resulted in more books of Reb Zalman’s thought, including Renewal is Judaism Now! and Integral Halachah. We’ve added two volumes to the Siddur Kol Koreh series, a weekday siddur and a High Holiday machzor, continued cataloging the many sound files of Reb Zalman teaching, and helped to support our ordination students through the Miriam Fisher Scholarship. Canadians have also begun to play important roles within ALEPH, as evidenced by Rabbi Jeremy Parnes of Regina who has recently completed several years as chair of the ALEPH Central Board and Rabbi Dr. Laura Duhan Kaplan who has re-joined the Va’ad which guides the ALEPH Ordination Programs.